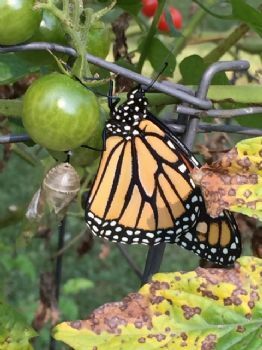 Here's s picture of a Monarch Butterfly that just emerged from its clear chrysalis. It's just hanging around until it's wings have dried. The drying process of flittering also strengthens their wings readying them for their purposeful flight. We humans also must flitter our muscles by exercising/strengthening them enabling us to be mobile and for our weight gain/loss maintenance. Whether a butterfly or human, mobility is the key to survive and function for a meaningful life. Wish I could flitter here and there feeding the nectar like the butterfly!